Add to this the complexities of HDR and WCG gamut, it is essential to ensure that the content is correct at every stage in the production process as the format changes between capture, production, post-production, server ingest and distribution. What is required is the ability to ensure continuity regardless of the capture format, production format, delivery format or the physical connection. The table shows the different possible formats that could be used at different stages and where it needs to be checked. Obviously, this is not a complete list, as new work flows are being set up by each broadcaster as they break new ground and establish the joined-up story that works for them. The tool set required to provide this level of continuity covers a range of disciplines including physical layer analysis, video and audio data analysis, video waveform analysis, audio analysis, conformance monitoring and logging of video levels, audio levels, loudness, closed captioning, etc. There are very few products that can provide this level of continuity checking through the broadcast production chain as well as provide the ease of use, depth of functionality, reliability and value for money expected by todays broadcast operations. Omnitek have worked for many years with broadcasters and post houses and have gained a reputation for providing the sophisticated tools that are required at the sharp end of program making. With the development of the Ultra platform, Omnitek have taken the opportunity to provide the comprehensive solution for broadcasters and broadcast post in the form of the Ultra TQ. Ultra TQs analyser instruments include picture, waveform monitor, vectorscope, gamut meters, full audio monitoring and loudness measurement, video timing, video / audio status monitoring, event logging and closed caption logging as standard. 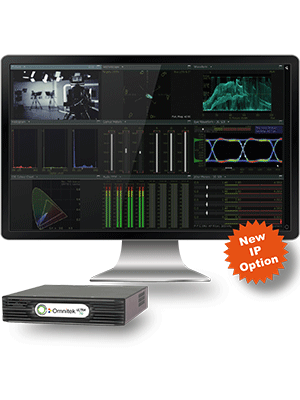 These can monitor either SDI or SMPTE 2110/2022-6 SFP inputs, making the Ultra TQ ideal for a mixed SDI / IP environment. The option structure has been designed to provide the basic functionality required for broadcast as standard with options to enable the more sophisticated functionality for more specialised analysis in different stages in the production workflow. The Ultra platform has been designed to be robust and reliable and comes with a years factory warranty as standard. This warranty can be extended, at nominal outlay to minimize the cost of ownership when maintenance budgets are tight. Omnitek operates a flexible upgrade process to accommodate changing industry needs and workflows and allow customers to migrate the functionality of their existing Ultra product to any other variant. The Ultra TQ and Ultra XR have a place at capture to ensure that levels are correct for HDR and SDR. Whenever format conversion takes place, for example camera S-Log to HLG, the Ultra TQ and XR can be used to ensure that the levels are still correct. During Post Production the Ultra TQ and XR can be used to ensure that the program is mastered in the correct colour space and levels for all of the different deliverables created from a variety of different source formats, dynamic ranges and colour spaces. At Server Ingest the Ultra TQ and XR are already being used to ensure that the material ingested has the correct video levels, correct profile (SDR, HDR, PQ, HLG), correct colour space (BT.709, BT.2020) correct audio mapping, correct audio levels & loudness, correct audio encoding (Dolby, PCM) correct closed captions (608, 708, OP-47), correct parental controls etc. The sophisticated tool set and low price per program channel has already seen the Ultra TQ and XR adopted by broadcasters around the world.